A great Welcome Bonus with Temple of Nudges is being offered by Untold Casino this April! We love these bonus shakeups, they keep your gaming experience new and exciting. Especially when it comes hand in hand with a brand new game as well. What do we all love besides bonuses? That’s right, new games! 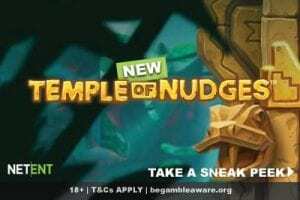 This is why, Untold Casino is launching the April Welcome Bonus on NetEnt’s newest slot, Temple of Nudges, released just today. NetEnt always provides top quality games, as a result, these games usually become major hits in the online casino industry. Temple of Nudges seems to be no exception, from a brief look it shows superb quality and great graphics, so this looks like it has everything a major hitter needs! April Welcome Bonus consists of 100% up to €250 bonus & 50 free bonus spins on Temple of Nudges and two other games (Jungle Spirit and Jumanji). The bonus is only available until the 1st of May, with a turnover requirement of 40x (deposit + bonus). It is available for all new Untold Casino players, except players from the UK. Read all terms and conditions of this promotion here. So all you guys that are not UK players, we hope you enjoy this new promotion, and for our UK players updates for bonuses are usually regular so please keep updated. If you have any thoughts on this new offer let us know here at Casino4U. Leave a comment below or on the Untold Casino Review page. Every comment or input you guys give helps us here give the best rating for each casino. As always have fun but please gamble responsibly.